Maxillofacial infections are one of the oldest disease processes treated by oral and maxillofacial surgeons. They commonly present to the office, or in severe cases to the hospital emergency room. Although the majority of infections can be treated in a non-emergent fashion, early recognition and correct management of severe infections can be life saving. Knowledge of the surgical anatomy, and path of spread of infections in the head and neck is fundamental in correct diagnosis and treatment. 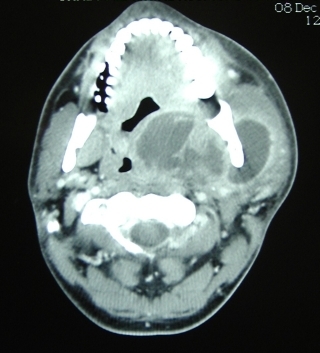 The ability of severe infections of the sublingual, submandibular, and parapharyngeal spaces to cause airway compromise, cavernous sinus thrombosis, and the possibility or mediastinal spread of infection have been causes of mortality and morbidity, especially in the medically compromised patient that present late in the disease process. Despite the availability of a wide spectrum of antimicrobial agents and increasing knowledge of microbiology, the treatment of odontogenic infections remains primarily surgical. Removal of the source of infection and establishment of adequate drainage for elimination of the purulent material is the mainstay treatment. Adequate antibiotic coverage is however important and should not be overlooked. Dr. Bagheri has extensive training and experience in the surgical management of simple and complex infections of the head and neck. Benign neoplasm of the lower lip. Benign neoplasm of the lower lip. Neoplastic. Epithelial, connective tissue, glandular, lymphatic, osseous, muscle, and vascular tumors that can be characterized as either benign or malignant tumors. Metastatic disease to the head and neck are by definition malignant. Dr. Bagheri can assist in the diagnosis and treatment of the many facial pathological processes.